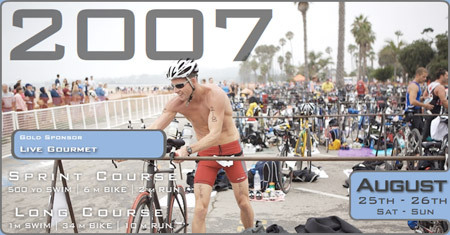 Just signed up for the Santa Barbara Long Course Triathlon on August 25, 2007. I haven’t done this triathlon before but hear that it’s well-organized, features a beautiful course, and is a great destination race. It’s a bit shorter than a standard half-ironman (only 1 mile swim, 34 mile bike, and 10 mile run), but apparently includes a fairly challenging bike and run. Anyone have advice or tips for racing at Santa Barbara? Will spend a few days before and after the triathlon to spend time with family and friends. Can’t wait. This entry was written by Brian McNitt, posted on at 1:27 pm, filed under Triathlon. Bookmark the permalink. Follow any comments here with the RSS feed for this post. Post a comment or leave a trackback: Trackback URL. After Treasure Island, I’m sure it will be beautiful with better roads:) Seriously I’m sure you’ll have a great time. Santa Barbara is just a great place and I think some folks in the club are heading down to race.